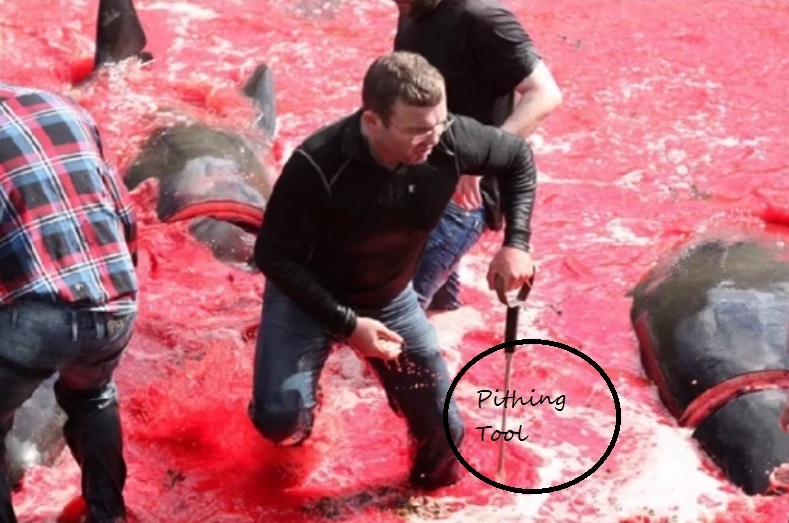 The Pithing Tool is used to sever the spine behind the blowhole a cruel and inhumane practice of slaughtering dolphins. An example can be seen in footage from Taiji hunters instructed by the Faroe Islanders in the slaughtering technique. The suffering of highly intelligent beings has begun as the Faroe Grind Summer 2014 takes the lives of 13 long finned pilot whales, a large dolphin that migrates through the North Atlantic. The small family of whales was driven into the shores of Fuglafjørður a village on Eysturoy’s east coast in the Faroe Islands. Its name means “fjord of birds”. The village is at the edge of a bay and expands into the surrounding steep hills. Despite scientific findings that dolphins have large complex brains, languages, and cultures the terrible hunt continues. “No information has been released as to the reasoning behind the schedule change, but it’s likely that passengers–many of which are traveling with children–would be disturbed to see the slaughter, which happens on the beaches and usually fills the harbor with red water. Animal rights advocates criticize hunts like these for being cruel and unnecessary, because the level of mercury in pilot whales makes them unfit for consumption”. This entry was posted in Cetaceans, Dolphins, Whales and tagged Atlantic Ocean, Data Deficient, Dolphin, dolphins, EndTheGrind, Faroe Island, Fuglafjørður, Long-finned pilot whale, North Atlantic, The Grind, Travel Faroe Islands by Kirsten Massebeau. Bookmark the permalink. I was also going to blog this. Thank you for posting!! I’ve seen this, I know about it, yet each time I revisit, I’m stuck for a moment. I struggle for the words to express my disgust at the insanity, the barbarity, the stupidity. I can’t turn the volume high enough on my reaction for this; it’s an anger beyond words, a sadness beyond tears. “Culture” is static and every changing. I would love to see a connection between the Faroese and the whales that celebrated their history but acknowledged their superior intelligence and all they have to teach us. “Celebrate” don’t harm these amazing beings. Let culture evolve in a positive way! Cetaceans are higher beings with brains similar and in many ways more complex than human brains. Their emotional centers are highly involved! Actually their culture ties are so beyond mans. The pilot whale truly has so much to teach us as all cetaceans. They are the people of the sea and I feel sorry for you that your are unable to understand or connect with these higher beings. I live on a Coast line where the dolphins hang way out. We don’t see them often. To be so lucky to celebrate their lives. I guess I am just sorry that you have missed this amazing opportunity I only dream of having to interact and commune with the people of the sea.